Stan Rogers’ “Northwest Passage” has been floated for years as a worthy replacement to the Canadian national anthem. In the song, a modern driver, envious of early colonial Canadians, wishes that “For just one time, I would take the Northwest Passage.” Today, the piece may be more representative than ever before as Canadian and international policy increasingly drifts towards acceptance or ignorance of climate change in favour of the melted ice caps’ economic potential. The Arctic Council is made up of Canada, Denmark, Finland, Iceland, Norway, Russia, Sweden, and the USA along with other, “observer status,” actors. It was based on the Arctic Environmental Protection Strategy of 1991, but in 1996 the group decided to drop environmental protection from the name. The body discusses policy related to the region north of the Arctic circle, establishing their jurisdiction regionally, commercially, and politically. In a region thought to contain vast deposits of oil and natural gas, at 13 and 30 per cent of global reserves, the group effectively established a cartel meant to exploit the resources of the Arctic with as little political friction as possible. In an era where melting sea ice makes shipping lanes out of Arctic straits, this area has led to increased economic interest worldwide. The U.S. and Russia are both competing for claims to Arctic resources. The Kremlin’s policies are based on a 2009 research paper in which the region would become its “top military strategic base” by 2020. Already, 20 per cent of Russian GDP comes from the Arctic, while Russia’s Northern Sea Route (NSR), with particularly melted ice, is a faster way of maneuvering through the area. The American position is to mitigate Russia’s territorial and economic advantage (reminiscent of the Cold War’s DEW line), and secure access to the same northern energy resources. China is now following the trend. Its Polar Silk Road initiative declares itself a “near-Arctic state” so that it can become the major transporter through the new (and improved) ice-free Arctic. The Chinese have made no territorial claims to the Arctic, instead leaning in to advise on certain mutually beneficial policies. Canadian policy humbly states Canada's sovereignty over Northern Territories and the Northwest Passage. Historically, Liberal and Conservative federal governments have invested in international bodies like the Arctic Council and the UN to facilitate agreements, rarely acting against their accord. While the Canadian military has increased military exercises in the region, public opinion in the True North is generally against the option of security favouring diplomatic approaches. Indigenous claims to the land are often forgotten, and while an entire article may be dedicated to the subject in the future, this one lacks the space for an appropriate discussion. For further reading, click here. As the region warms at twice the global average rate, melting the ice caps have created feedback loops where the effects of the erosion lead to warmer temperatures. A recent NASA report discovered that Arctic permafrost, one of the largest natural reserves of carbon trapped for thousands of years by frozen soil, could abruptly thaw, taking global warming towards catastrophic acceleration. 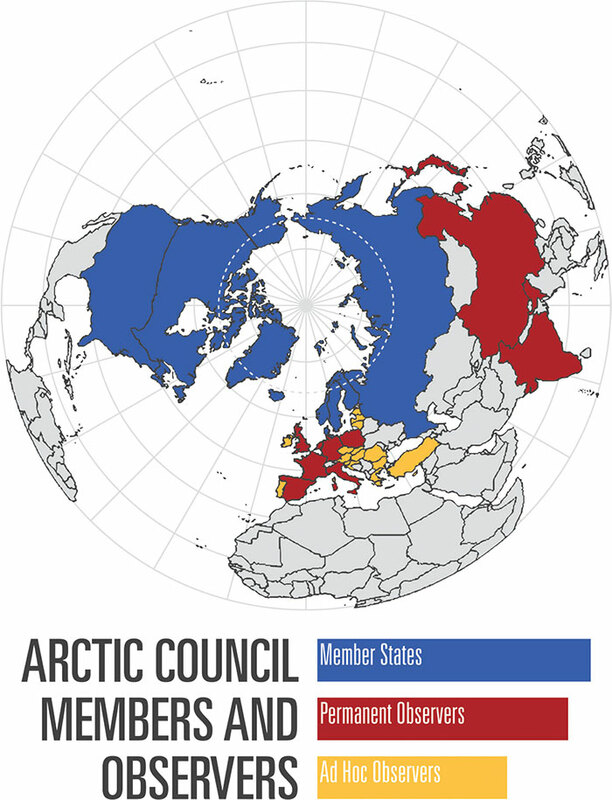 Instead of focusing on a looming apocalypse, the Arctic Council’s membership has maintained an interest in the monetary potential of its region. One article from the University of Ottawa by Mathieu Landriault has hailed the “the opening of a new ocean,” and looks forward to new fisheries and trade routes. Minor declarations, such as one non-binding request in 2015 that countries avoid commercial fishing, pale in comparison to the oil and gas revenues soon to be enjoyed by the council’s economies. Militarists also play a role, with CSIS Senior Vice-President for Europe, Eurasia, and the Arctic Heather Conley commenting, “Tough national decisions […] and assessments must be made about the Arctic’s future security.” Security issues related to the climate are not mentioned. Rather than act towards its prevention, the Arctic community has cheered the demise of the ice caps, disregarding the environmental devastation they will leave in favour of the economic benefits. Decades will reveal which actors end up floating over a melted Arctic, but in the ongoing quest for the Northwest Passage, we’re all going down with the ship. Canada’s refugee fast-track: Humanitarian urgency or political games?